Genetic testing is a type of medical tests that identifies changes in chromosomes, proteins or in genes. The results of this type of tests confirms the genetic issues if any in patients. Genetic testing represents the most rapidly expanding segment in the molecular diagnostics market globally. Growing incidence of genetic diseases opens up new opportunities for genetic testing. The conversion of genetic testing from being a service-driven to a product-driven market is expected to provide a thrust to the diagnostic companies for the expansion of their business globally. The market for screening the Diagnostic, newborns, rare and fatal disorders, and predicting the probability of occurrence of diseases is likely to expand. Mainly, genetic tests to screen the newborns are expected to expand immensely over the coming years. Genetic testing is a sophisticated and typical form of medical testing to identify smallest changes in genes, proteins or in chromosomes that are associated with problematic diseases. The positivity or negativity of such tests can confirm suspected genetic condition and helps the doctors, physician with greater precision towards treating in genetic disorder. Genetic testing is a bit expensive and cannot afford by all of the people. Due to time and knowledge required in the testing of rare diseases genetic testing is expensive procedure and cannot be adopted by normal peoples. This is the major drawback and it affects the growth and affects the market globally. Genetic testing market growth is growing by increasing adoption in oncology applications, growing public awareness and demand for customized medicine. There is an increase in life expectancy and a growing aging population. There is rise in growth of chronic diseases and an increasing incidence of cancer etc. and these factors are boosting growth of the genetic testing market. The major role of genetics in diseases and health is now understood. This new combined knowledge with lower pricing is taking genetic testing market to the next level. The genetic testing market is growing rapidly in breadth and in the volume of tests creating new life in the industry. Consumer demand for effective and safe way to treat diseases is rising. The scenario is beneficial for demand for genetic testing, the important role played by this tests to identifies the problematic chromosome, and genes are way too high. The genetic tests is very much helpful in identifying Cancer, cystic fibrosis, Alzheimer’s. Molecular diagnostic involves analysis of DNA and RNA, this drives the increasing awareness of human genome. Faster screening, technological advancement, accurate detection and genetic testing. The major reason also includes favorable regulation environment, adoption of genetic testing by physicians in daily routine etc. Technological advancement in the field of genetic testing drives the physicians to determine the patients’ health at different levels of treatment by diagnostic procedures. With advancement in DNA analysis, the scope of genetic testing widens up in different areas, mainly in pharmacogenomics, predictive testing, and prenatal testing and so on. The early detection of genetic disorder reduces mortality rates. Genetic testing also enhances the early detection of breast cancer. 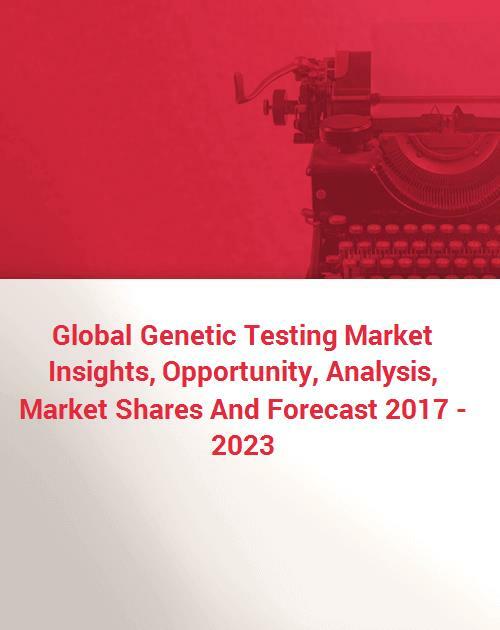 The global genetic testing market is segmented into type, application and regional outlook. In type market is divided into carrier testing, diagnostic testing, newborn screening and prenatal testing diagnostic testing is majorly used in the area to identify problematic chromosomes, genes and other proteins. In application market is segmented into cancer genetic testing, prenatal genetic testing, pharmacogenomics, and predisposition testing. Cancer genetic testing is having the largest market share in this segment. Cancer is very chronic disease and it took millions of lives per year. Genetic testing identifies the problematic alteration in the body. This save many lives of the people. In regional outlook market is divided into North America, Asia pacific, Europe and rest of the world. U.S is the global leader in genetic testing market, the major reason in growth of this region is due to technological advancement in the field of genetic engineering, increasing prevalence of genetic diseases and high quality of infrastructure. Asia Pacific is the fastest growing market due to increase in number of ageing population, increase in problematic diseases, and advancement in medical field. China is the fastest growing country in this region. Rest of the world is also growing in this market, major countries like Dubai and South Africa. Europe is also sharing the market due to ageing population and increased disposal income of the people. Major players like Roche Diagnostics Ltd., Pacific Bioscience Of California, Inc., Oxford Biodynamics, Myriad Genetics, Inc., Luminex Corporation, Laboratory Corporation Of America Holdings, Qiagen N.V etc. are using merger and acquisition, new products developments to expand. 5. Htg Molecular Diagnostics, Inc.
14. Pacific Biosciences of California, Inc.
- Htg Molecular Diagnostics, Inc.